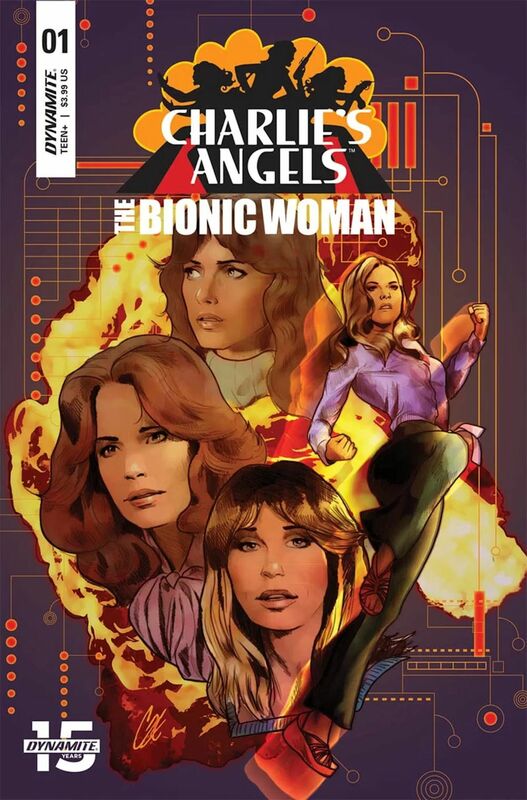 For the first time ever, the Angels meet the Bionic in the crazy 80’s in Charlie’s Angels/Bionic Woman, from Dynamite Entertainment. Bringing together Sony Pictures Entertainment’s Charlie’s Angels and Universal’s Bionic Woman is a first in comics and a winning crossover event in print. Cameron DeOrdio (Josie & the Pussycats) brings his honed writing abilities and love for both franchises to the table, while artist Soo Lee (Strange Attractors, Fight Like a Girl) draws these women in her one-of-a-kind style. Colourist Addison Duke (Barbarella/Dejah Thoris, Curse Words) and letterer Tom Napolitano (Justice League, Aquaman, Red Sonja) round out the team inside the book. On the outside, a compelling cadre of cover artists include the sensational Cat Staggs (Crosswind, Wonder Woman ’77, Star Trek), indie darling Jim Mahfood (Spider-Man: Into the Spider-Verse, Tank Girl, Grrl Scouts) and paperback cover and movie poster legend Ron Lesser (The Spider).